… the festive season is done and dusted (almost). Never a great lover of Christmas day, I’m only too happy to while away the evening drinking my free Heineken and watching what seems to be the same old TV shows and films I was watching at exactly this time last year… Coincidence? No, it just seems that the assistant patron saint of Christmas time is Willy Wonka. 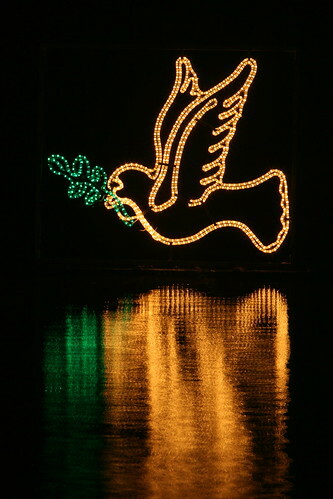 The Dove from Above, out floating in the lough over the festive season. The one place that the majority of Cork seem to congregate to walk off their Christmas dinner on the big day. I had every intention of taking my usual spin out there to do the very same, but laziness (and Monsters Inc.) decided otherwise on my behalf. 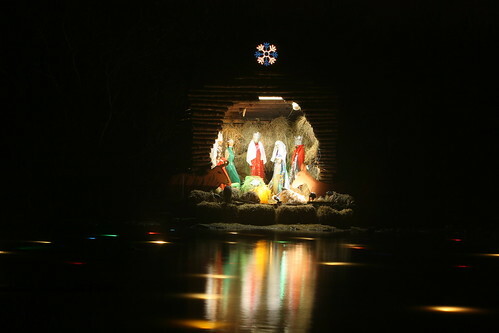 Again in the lough, a traditional seasonal scene that was last night thumping out carols over a megaphone. Quite an oddity to come upon while walking around the perimeter of the lake on a dark winters evening. A couple more of this sort of thing on flickr. To all my loyal readers, occasional glancers and perchance googlers, Happy Christmas and enjoy the rest of the season. Thanks for your views and comments over the year, they’re all appreciated. Now, c’mon the new year! This entry was posted by Ryan on December 25, 2006 at 10:02 pm, and is filed under Irishphotos, Photography. Follow any responses to this post through RSS 2.0. You can leave a response or trackback from your own site.